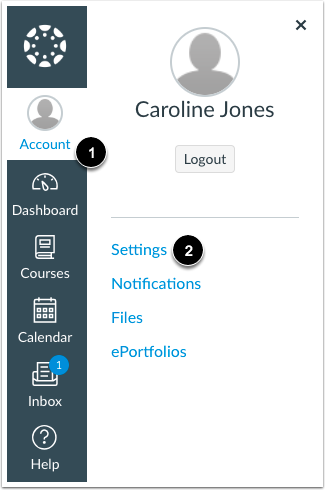 If you signed up for a Canvas account as a parent, you can add students to observe within the same institution. 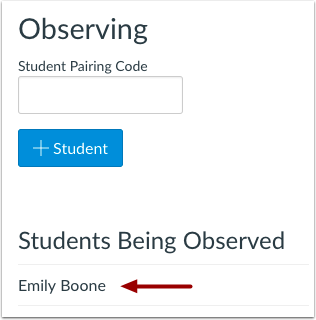 Additionally, if an institution created an observer account linked to a student for you, you can add students to observe. To link yourself to a student, you will need to enter a student-specific pairing code. Pairing codes are case sensitive and are valid for seven days. Students can generate pairing codes from their User Settings. 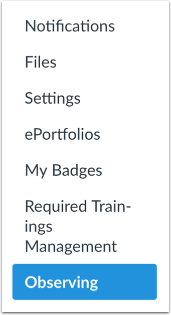 Depending on institution permissions, admins and instructors may also be able to generate pairing codes. For more information on pairing codes, view the Pairing Codes - Frequently Asked Questions PDF. You cannot add students whose accounts are not within your same institution (Canvas URL). To observe students in another institution, you must sign up for an account using that institution's Canvas URL. If you are not able to access all of a student's courses, the option to link to additional students is not available to you. Once you have linked to a student from the Observing page, you cannot remove the student. To remove a student, please contact the student's instructor. In User Navigation, click the Observing link. 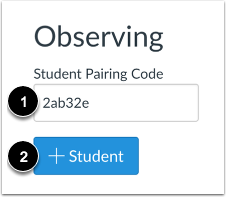 Type the pairing code in the Student Pairing Code field  and click the Add Student button . Previous Topic:How do I accept an invitation to join a course as an observer? Next Topic:How do I use the Calendar as an observer? Table of Contents > Introduction > How do I link a student to my user account as an observer? Re: Pairing code goes where? Re: How do mobile app users add a second student that they want to observe?